(Describer) Two dolphins leap and dive in an ocean. A large iguana has spikes on its back. A jellyfish opens and closes in slow-motion. A tiny frog has bulging eyes and orange feet. thousands of mammals, fish, and birds-- all astonishingly different. (Describer) Red and blue macaws soar, and a tortoise swims. How did so many species come to be? (Describer) A seabird has blue feet. Clouds drift behind a peninsula. To seek insights into that question, researchers are focusing on places where species recently arose, such as the remote Galapagos Islands. Scientists are making observations and conducting experiments that would have surprised Charles Darwin. (Describer) Waves crash onto rocks. (Describer) Steam rises from holes in a slope. (Carroll) The Galapagos Islands are one of the most spectacular landscapes in the world. Home to a variety of species that live nowhere else. (Describer) Large iguanas with spikes along their backs walk on a beach. Two people sit on a boat. Biologists Peter and Rosemary Grant have been seeking answers to how species arise by focusing on one of the smaller islands-- called Daphne Major. (Peter) When we started out, we had no plan for the long term. In fact, we thought it was just going to be just a few years-- maybe two years. (Carroll) Two years have turned into a 40-year odyssey. The Grants have returned every summer since 1973. (Rosemary) Oh, there's a bird. (Describer) A small bird sits on a cactus. (Carroll) Here, they've made some of the most remarkable observations in the history of field research as they studied the famed Galapagos finches. (Describer) A slightly lighter-colored one lands, its mouth open. (Describer) As a large crane grooms itself, a tall ship approaches on the sea. 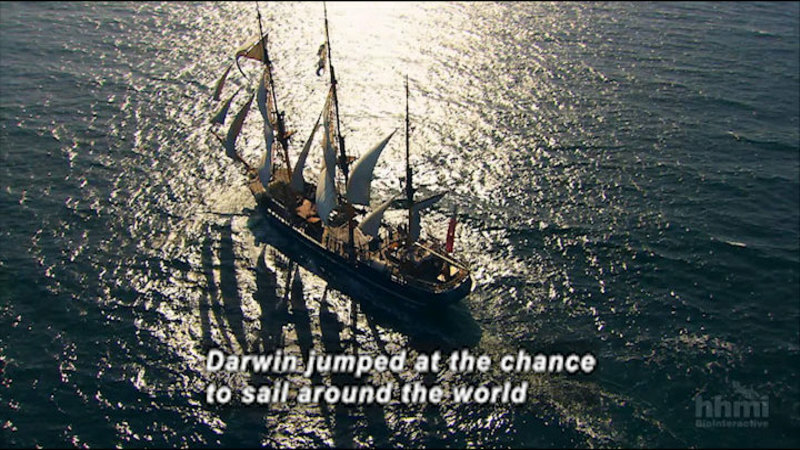 when his voyage around South America brought him to this cluster of islands 600 miles from mainland Ecuador. (Describer) The journey is illustrated with a blue line around the islands. An underwater volcano erupts. These volcanic islands are geologically young. They began rising from the ocean floor less than five million years ago. At first devoid of life, they now support a modest number of species. (Describer) A huge grey-brown tortoise peers around. Another black bird pokes its beak into a flower. Among them, 13 species of finches found in various combinations on the different islands. (Describer) One with a white breast flies off. The birds live in diverse habitats. (Rosemary) The islands are very different from each other. They differ in size. They differ in topography and in height. (Describer) Steam drifts down steep slopes. (Carroll) Larger trees grow at higher elevations, while low islands have mostly cactus, grasses, and shrubs. (Describer) ...where a black finch sits. In these diverse habitats, the finches have evolved many ways to survive. (Carroll) So Rosemary, what's the important difference between these birds? (Rosemary) This little warbler finch with its very fine, needlelike beak is perfect for picking off insects. This one is the woodpecker finch with a rather more robust beak. It concentrates on beetle larvae and termite larvae. (Describer) One pulls larvae from a hole in a branch. Then we have the cactus finch with a much longer, sharp, pointed beak, which probes into cactus flowers. And then these three species are the large, medium, and small ground finches. So, Sean, a basic idea is, the beaks are tools, and you need the right tool for the right job. (Describer) The beaks morph from thin to large to short to long. (Carroll) The finches look so different that Darwin first mistook them for entirely unrelated kinds of birds. (Describer) A shorter beak is shown. How did the Galapagos end up with so many species of finches? In terms of the actual history of the finches of the Galapagos, there were many different possibilities. Different kinds of finches could have all come from the mainland separately. (Describer) Theories are animated with lines. 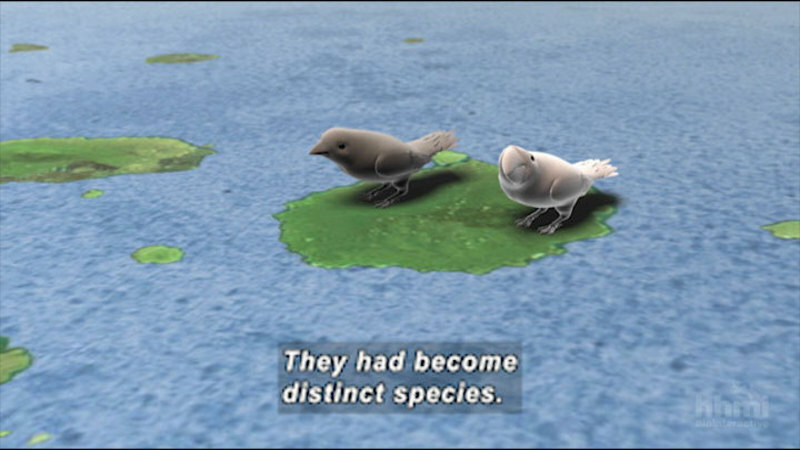 Or the finches could have all evolved out there on the islands. (Describer) Lines connect the islands. (Peter) Well, now we know from DNA evidence that all of the finches are more related to each other than any one is to a species on the mainland. And that tells us only one species arrived on the archipelago and diversified into the 13 species that we see nowadays in the Galapagos. (Describer) A finch sits at the end of a branch. So they've all come from a single common ancestor. (Describer) Several of them fly. Rosemary hikes up a rocky hill. (Carroll) The question then becomes, how did one ancestral population give rise to many different species, each adapted to a different lifestyle? (Describer) Peter watches finches through binoculars. 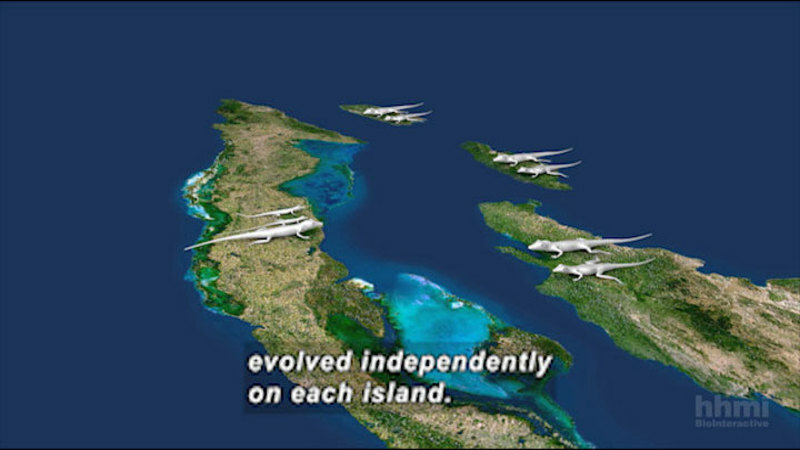 A crucial insight into how adaptation occurs came when the Grants focused on one species on the island of Daphne Major. (Describer) The Grants hike together. (Peter) The factor of great convenience for us was the small size of the island. (Describer) They walk by two larger birds. That meant that we could walk all over the place. (Peter) I'll leave that one to you. (Rosemary, voice-over) The idea was that if we worked really hard, we could follow every individual or almost every individual. (Describer) They put up fine netting. (Carroll) They rose at 5:30 each morning to net the island's medium ground finches. (Describer) One flies from a cactus into the netting. Later, Peter holds it. They measured the size and shape of each bird's beak, the bird's weight, and they tagged them for identification. (Describer) He fits a tiny one on a young finch. (Peter) The male is the 17-418. (Carroll) Year after year, they returned, at times tracking over 1,000 finches. (Describer) With Carroll, Peter shows him a photo. So here's an example of a bird we know intimately over the whole of its lifespan. The number is 5960. We know how many times it bred, which years it bred in, how many mates it had, how many offspring it produced. And then how many of those offspring themselves survived long enough to breed. (Carroll) Over the first four years, little seemed to change. (Describer) The Grants continue hiking. Then in 1977, a terrible drought began. (Peter) Virtually no rain fell for the next 18 months. (Rosemary) The vegetation practically disappeared, apart from a few trees without any leaves. And of course, the cactus bushes were still there. (Describer) They approach an expanse of sand. (Carroll) Now the medium ground finches had to compete for scarce food. They started off with a big food supply of small seeds, medium seeds, large seeds. As these small seeds became very scarce, they had to turn increasingly to the large and hard seeds. Well, only birds with large beaks can crack open these woody, spiny fruits. (Describer) The second set of seeds is large with spikes on them. (Describer) Brush lies among short cacti. (Carroll) The birds with the smallest beaks had the most trouble. (Rosemary) They were scraping about amongst the rocks, and their plumage got so worn that they could barely fly. (Carroll) That year, over 80% of the medium ground finches died. (Peter) We would go around looking for birds that had died. And it's very sad to pick up a bird and say, "3972. "Oh no, not that bird. Oh." (Describer) A living one is held as photos are taken. (Carroll) When they inventoried the surviving medium ground finches, they discovered that one trait had made the greatest difference between life and death. (Peter) What I'm showing here, a distribution of beak depths of the population in 1976. The survivors of this group are shown in black. (Describer) Percentages get higher with greater beak depth. So the larger the beak, the better your chances? The larger the beak, the higher the likelihood of surviving through the drought of 1977. (Describer) In the field, they weigh more finches. (Carroll) When they looked at the offspring, they found an even greater surprise. (Describer) A beak is measured. The average beak depth was more than 4% larger than the previous generation. (Describer) A updated bar graph illustrates. Natural selection had changed the average beak size. Could you have ever imagined measuring and observing something like this on such a short time scale until you actually did it? When we started, the answer is no. We could not imagine we would be able to do it. (Describer) Clouds pass in fast-motion. (Carroll) But was this a fluke? Or are changes like this happening all the time? Five years later in 1983, an unusually strong El Nino brought ten times more rain than normal. (Describer) Water gushes over rocks. And the island was overrun by vines that covered even the cactus. The rains changed the vegetation on the island, such that two years later when drought struck, larger seeds became scarce. (Describer) One of the black ground finches pokes at leaves. The birds with larger beaks now had difficulty picking up the more abundant food-- the small seeds produced by the vines. (Describer) A mother feeds three large babies. That year, many more finches with small beaks survived. And their offspring inherited smaller beaks. (Peter) So the selection had swung in the opposite direction, and evolution had occurred as a result. (Describer) A younger finch perches off a cactus. (Carroll) In an amazingly short period of time, the Grants had measured evolution of beak size, not once, but twice-- demonstrating that when birds encounter different environments, they will change over a very short amount of time. (Describer) One island has a crater in the center. Over millions of years, changes like these occurring throughout the Galapagos generated all sorts of beak sizes and shapes. But that's only part of the story. How did finches with different beaks become distinct species? (Describer) Elsewhere, wildebeests graze with zebras. Species are defined as populations whose members don't interbreed. (Describer) Carroll sits on rocks. So how does one species split into two? A typical scenario is that two populations become separated geographically and undergo enough change in their respective habitats that if or when they come into contact again, they do not mate. (Describer) The Grants watch birds fly by. So in the Galapagos, the Grants asked, what keeps different species of finches from mating? (Rosemary) We were very conscious that on any given island, the different species sing very different songs. This is what a cactus finch sounds like. (Describer) She plays from a computer. Whereas the medium ground finch sounds very much like this. (Describer) A finch flies from a cactus. (Carroll) So to see if songs keep the species apart, the Grants and their student Laurene Ratcliffe, played each species' songs through a loudspeaker. (Describer) A couple finches take off as Peter holds a tape player. (Rosemary) When we played back the cactus finch song, cactus finch came to the loudspeaker, and the medium ground finch completely ignored it. (Describer) A speaker stands on a tripod. (Carroll) The males only responded to songs of their own species. (Describer) The Grants write notes among rocks. The Grants looked at whether finches might also choose mates based on appearance. So they put out stuffed female specimens to see if males would respond. (Describer) In photos, a male approaches a stuffed female. (Rosemary) Clearly, they could discriminate. The male vigorously courted a female of his own species; completely ignored the other one. (Carroll) The males only courted females that had a similar size and similar beak. Song and appearance both play a role in keeping different species from mating. So when populations of the same species are separated, changes in these traits set the stage for the formation of new species. The Grants have shown that both geography and ecology are keys to the evolution of the Galapagos finches. (Describer) One leaves a nest in a cactus. The most likely scenario is that two million years ago, a single finch population arrived from the mainland. (Describer) The process is animated, with one bird on one island, and a line extending. When their descendants reached another island, they faced new conditions. (Describer) Another finch appears on another island. As those isolated populations adapted to their surroundings, their traits changed. (Describer) Its beak gets thicker. If the changes included traits involved in mating, and the populations came into contact again, they no longer mated. They had become distinct species. (Describer) Among cacti and a field of dry grasses, a yellow bird holds a twig. While unique to these remote islands, the history of the Galapagos finches offers a general insight into why the world is populated with so many species. (Peter) The more diverse the environment, the more opportunities for evolutionary change to produce those new species. (Describer) A cliff forms a C shape around a bay. A bird flies off. (Carroll) Over 150 years after Darwin first recognized their significance, these unassuming birds still illuminate how the great diversity of life arose and continues to evolve. (Describer) Several seals swim just under the surface, and a white seabird soars above. Others fly past cactii. (Describer) Titles: Producer, Director: Dan Levitt. Writers: Dan Levitt and Sean B. Carroll. Narrator: Sean B. Carroll. Copyright 2013 Howard Hughes Medical Institute, All rights reserved. Funding to purchase and make this educational program accessible was provided by the U.S. Department of Education. Contact the Department of Education by telephone at 1-800-USA-LEARN, or online at www.ed.gov. Over the past four decades, evolutionary biologists Rosemary and Peter Grant have documented the evolution of the famous Galápagos finches. They track changes in body traits directly tied to survival, such as beak length, and identify behavioral characteristics that prevent different species from breeding with one another. Their pioneering studies have revealed clues as to how 13 distinct finch species arose from a single ancestral population that migrated from the mainland 2 million to 3 million years ago.